The Models is built on a 4 mm u-bended chassis. All borings of the lower side are countersunk, therefore the screw heads can’t bear out. Double wishbones at font and rear axle as well as 4 bulk oil-pressure shock absorbers guarantee perfect ground adherence. All rotating parts are supported by ball-bearings. Rear gear wheels, differential gears and all driving elements are case-hardened. The side guards protect the model from dirt. The model is equipped with a powerfull 26 ccm engine which runs with normal 2-stroke petrol-oil mixture (available at every petrol station). The tank filling of 0,7 liters enables you to drive about 45 minutes. The engine can be started without difficulties through the integrated pull-start. To complete the models all merchantable servos and radio control systems are suitable. 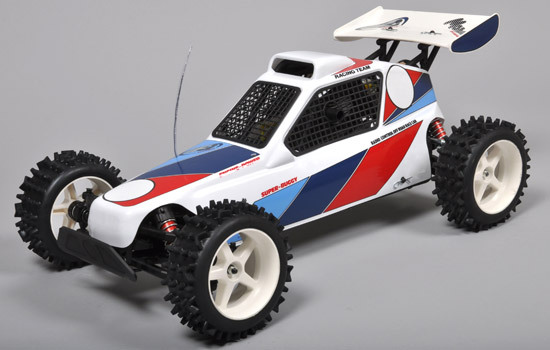 The RTR versions are delivered with a 2,4GHz radio set, item number 07573, as well as with metal pignon Hi Torque servos for gas and direction.